While environmental histories of landscape transformation, particularly stories about the reclamation of land from water, or straightening and controlling rivers, are often told in terms of conquest and its unintended consequences (see Blackbourn), fighting catastrophic wildfires are frequently framed as reports from the battlefield, as catastrophic disaster stories (see Pyne, 1997, esp. 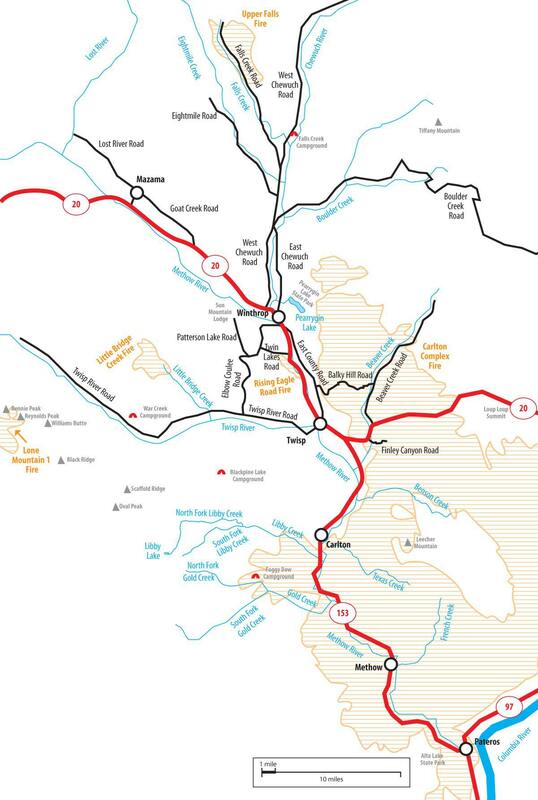 the chapter on “Fire and Water: A Fire History of the Northwest”) or as Sisyphean tasks especially with respect to the building and rebuilding that accompanies these events (see Mauch). Click here to view Methow Valley News source. Graphic by Darla Hussey, Methow Valley News, all rights reserved. In 2014 and 2015, Methow Valley in the northeastern part of the US state of Washington experienced the largest wildfires in the state’s history, where 420 square miles burned, 239 homes were lost, 246 units of equipment were used on the fire, 3,142 people were working on the fires at one point in time, and altogether 69.4 million US dollars were spent on fire suppression. The narrative and rhetorical framing of these two catastrophic events in the local media, the Methow Valley News, complicated this trope by retelling the story as a Trial by Fire, i.e., a challenge that can be overcome and one that even inspired poetry and stories of resilience and generous acts of community involvement. These narratives drew on generic conventions from the repertoire of Western culture, ranging from tragedy and tales of heroic characters, to family stories and ironic tales that humanize the Fire. Photo by Sabine Wilke, 2015. 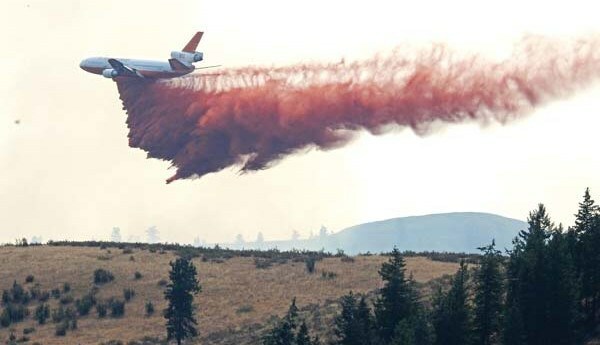 To the close observer of an extended wildfire season who lived through thick smoke, red sunsets, roaring Blackhawks overhead, and, eventually, the sight of DC-10s dumping retardants on people’s homes, the scenic aspect of the nature show did not go unnoticed. Nature put on quite the performance, lighting up the night sky and creating aesthetically pleasing cloud plumes that blended in with the sublime image of a blue summer sky. To further explore striking images of sublime wildfire scenes, I recommend looking at the photos in “The Terrible Aesthetics of Wildfire I and II” listed in the links below. © Photo by Mary Kiesau. All rights reserved. The rhetorical model for retelling this nature scene in the local media was the metaphor of the capricious monster. 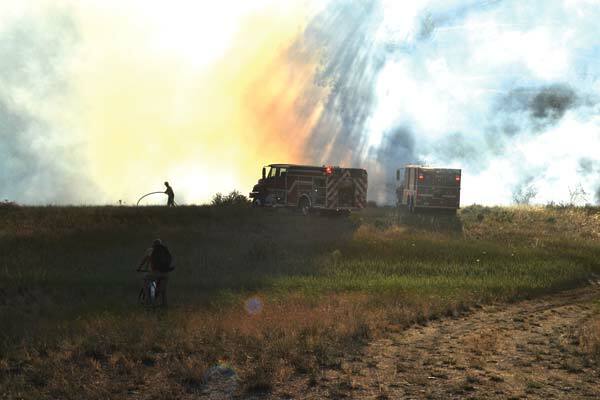 As Don Nelson, the editor of the Methow Valley News put it in his editorial for Trial by Fire: The Methow Valley’s Summer of Disaster: “The Fire. With a capital ‘F,’ because it had first and middle names—Carlton Complex—as if it had assumed a quasi-human identity” (p. 6). Nature’s dramatic and unruly agency was reframed in human terms as the actions of a petulant child, a raging bully, or maybe a wild deviant that had to be contained, an aspect also explored in an exhibit on “The Art of Wildfire” at the local art gallery in April 2015. © Photo by Ann McCreary. All rights reserved. While some of these stories from a war zone were phoenix-from-the-ashes narratives that emphasized the path to recovery (see Mauch), other coverage in the local media framed them in terms of deep, ambivalent entanglements of nature and culture that come together as a “complicated relationship.” In these news stories, fighting large wildfires in the American West is being reframed as the new normal of a long-term relationship with all its complications, emotional phases, financial ups and downs, lack of conflict management skills, even the memory of sweet moments and private rituals. The Fire becomes part of the West, and, as an unruly child that is contained, makes the family a stronger unit. As our understanding of the causes and effects of wildfires become more complex, our framing of disaster is likewise expanding to accommodate more nuanced and shifting fire stories. Wilke, Sabine. “Wildfire Genres: A Complicated Relationship.” Environment & Society Portal, Arcadia (Summer 2016), no. 7. Rachel Carson Center for Environment and Society. https://doi.org/10.5282/rcc/7423. Lowry, Mary Pauline. Wildfire. A Novel. New York: Skyhorse Publishing, 2014. Mauch, Christof . “The Double-Faced Nature of the American Dream: Conservation and Destruction in US History.” In Exploring the Green Horizon: Aspects of Environmental History, edited by Amit Bhattacharyya, Nupur Dasgupta, and Rup Kumar Barmann, 58-77. Kolkata/Delhi: Setu Prakushani, 2013. Mauch, Christof. “The Phoenix Syndrome: Natural Catastrophes in American History and Culture.” Journal of History 30 (2014-15): 19-38. Mauch, Christof. “Unruly Paradise—Nature and Culture in Malibu, California.” In: "Unruly Environments,” edited by Siddhartha Krishnan, Christopher L. Pastore, and Samuel Temple, RCC Perspectives, 2015, no. 3, 45–51. Pyne, Stephen J. Fire in America: A Cultural History of Wildland and Rural Fire. Seattle, WA: University of Washington Press, 1997. Pyne, Stephen J. Fire: A Brief History. Seattle, WA: University of Washington Press, 2010. Nelson, Don. 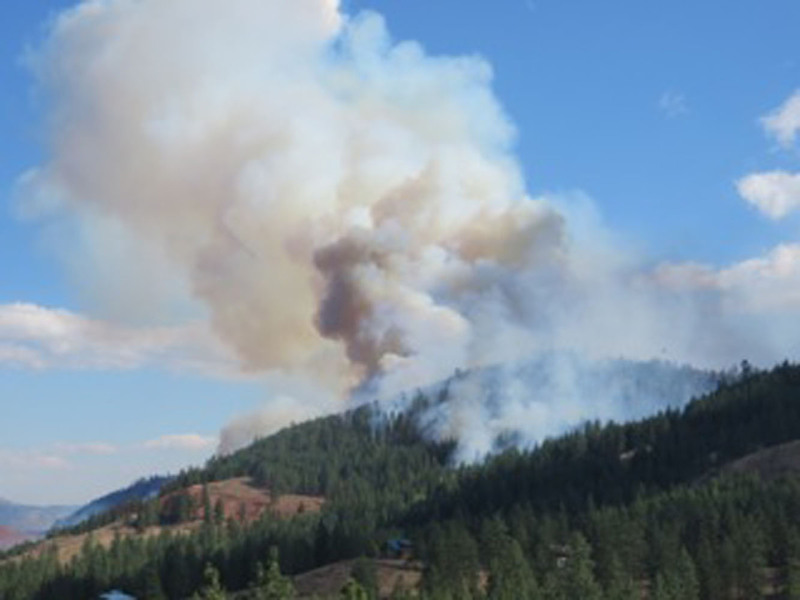 Trial by Fire: The Methow Valley’s Summer of Disaster. A Supplement to the Methow Valley News. 2015. NPR: Is Living With Extreme Wildfires The New Normal?